Stroker babies are short backed, all legs and built for speed. They are gentle and love people. 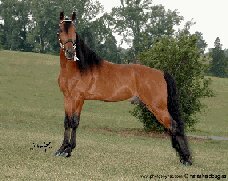 We searched for years for the right stallion, with prefect breeding, speed, conformation, color, smooth fast gait, gentle, calm nature, a head full of sense to breed into our Fancy Pants blood-lines, and we finally found what we were looking for in Stroker. The future is near!